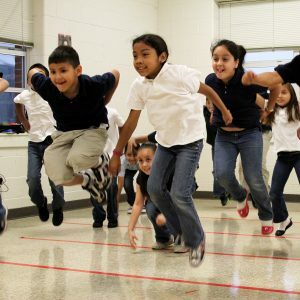 Founded in 1995, the Leaps and No Bounds program focuses on using kinesthetic learning as a means of reinforcing the skills necessary for success on state curriculum standards. 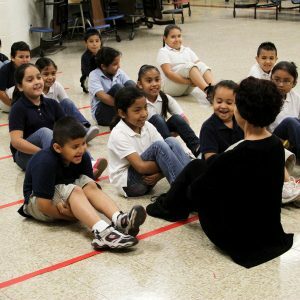 Impacting approximately 600 children in three low socio-economic elementary schools within the Austin area, this program uses weekly movement lessons as a method of reinforcing core classroom curricula and essential skills in language arts, math, science, and social studies for each grade level from pre-K through fifth. Since its inception two decades ago, the program has been cited repeatedly by teachers and administrators as a key component in their strategies to effectively educate their students. The kinesthetic nature of the curriculum effectively reaches students who are challenged in a traditional classroom setting, including students with language barriers and/or learning disabilities. Scheduling Leaps and No Bounds Classes at a new campus is based off the availability of our instructors and the needs of the school. Currently, classes take place on Tuesday-Friday at the various campuses we serve. Class times vary depending on campus schedules. The class requires a space large enough for the students to move through space in. For some campuses this is a classroom with desks and chairs pushed back and for others it is a dance room or cafeteria. Leaps and No Bounds currently serves Maplewood, Wooten and Oak Springs Elementary Schools. 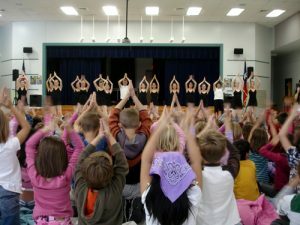 This program is provided at no cost to the students thanks to funding secured by Ballet Austin.